This Light and Creamy Chicken can be made in half an hour. This is a wonderful chicken breast recipe which uses evaporated milk and Greek Kefalotyri cheese to make it light and creamy. Two days ago, we came back to Asini for a week, so before coming home we passed from our supermarket to get some provisions. It was already 2 p.m. so I needed to fix a quick and easy dish. 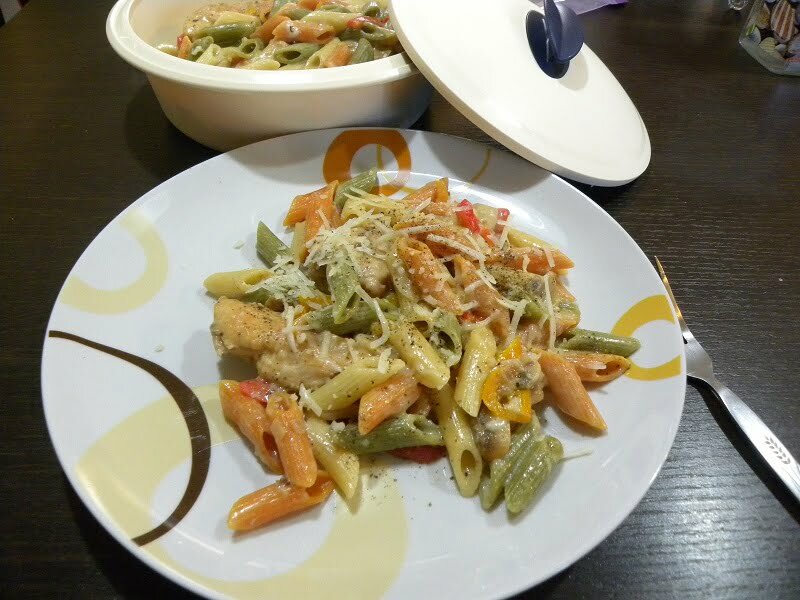 Among other things I bough a chicken and some penne, with which I planned to make a quick and delicious chicken and pasta dish. If you like creamy pastas you will love this recipe which I made using evaporated milk. Evaporated milk is concentrated milk, lighter than cream, which has a unique flavour compared to oridnary milk. Combined with the chicken broth and kefalotyri cheese, they add flavour and creaminess to this dish. The Kefalotyri cheese I used was from Elassona and was made of ewe’s milk only. Kefalotyri is a salty cheese, so don’t add more salt, apart from seasoning the chicken. Personally, I did not add any extra salt when cooking this dish. Don’t skip dredging the chicken in flour as this will help bind the cream into a thick sauce. If you want to make your own homemade chicken broth, this will take about 15 minutes to prepare. I usually buy a whole chicken and fillet the breast, which costs less than buying it filleted. I used the leftover carcass and the skin to make the broth. I put them in a pot with cold water and when they came to a boil, I added some salt. If foam forms on top it should be skimmed it with a ladle. I left a little bit of meat on the carcass on purpose as Dias, our dog, loves it and I usually mix it in his food. The broth is ready in fifteen minutes. While the broth is preparing I had all the time to (under)cook the pasta, chop the vegetables and to cut and dredge the chicken in flour. Cook the carcass and skin. Cut the chicken, season and dredge it in flour. Chop the bell pepper and mushrooms. > The final addition of cheese adds a nice saltiness and means you can cut down on the added salt in the seasoning. > Use a zip lock bag to coat the chicken with flour. Put the flour and chicken in the bag, close it and give it a good shake. You will need less time and less flour than coating each piece separately. > I used a 26 cm wok-type non-stick frying pan and fried the chicken in two batches. Do not pack the frying pan because instead of getting a nice crust on the chicken, you will end up boiling the it. > If you cook the pasta early, drain and keep it in cold water, so that they do not stick to each other or drain them, add cold water, drain them again, put them in a bowl and add some olive oil and mix. > Definitely add some freshly cracked black pepper on top and you have a delicious pasta meal. Wash the chicken and cut off the chicken breast. Remove the skin and bones and boil them in water to take the stock. Remove froth if needed, add a pinch of salt and boil for 15 minutes. Rinse the chicken breast and pat dry and cut into small slices, about 1 cm thick. Season chicken with salt, pepper, tarragon and chicken seasoning blend. Heat the oil in a non-stick skillet over high heat. Brown the chicken on both sides, (about 2 minutes each side) and remove to a plate. Remove chicken to a platter and sauté the onion, scraping the pan. Add the garlic and mix for a few seconds, then add the mushrooms and peppers. Cook for five minutes and then put the chicken back to the frying pan and bring to a boil. Add the broth, cover with the lid and lower to a simmer. Cook for ten minutes. Simultaneously, cook the pasta two minutes less than the time indicated on the package. Drain and set aside. Add the evaporated milk, put the pasta in the pan and the cheese, mix, and cook for two more minutes, mixing now and then. Serve with more kefalotyri and grated black pepper or top. Season chicken with salt, pepper, tarragon and chicken spices. Dredge it into flour. Simultaneously, cook the pasta 2 minutes less than the time indicated on the package. Drain and set aside.